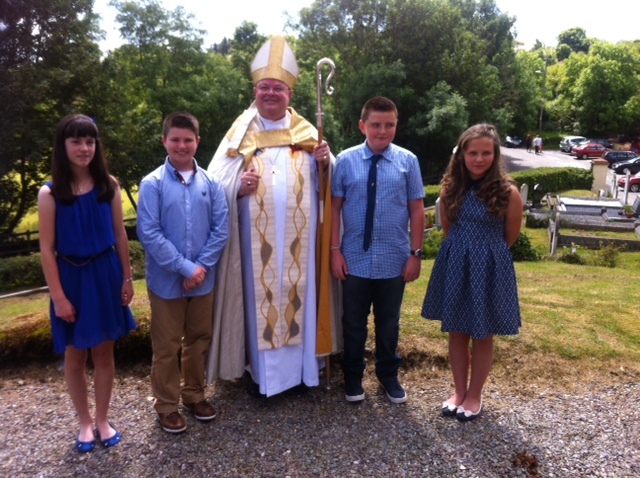 The Bishop of Cork, Cloyne and Ross, the Right Reverend Dr Paul Colton, was at the Church of Saint Matthias, Ballydehob, County Cork on Sunday, 6th July, 2014 where he confirmed three young people. Also present was their friend and a member of the same confirmation group who was confirmed earlier in the year by the Bishop at a Service in the neighbouring parish of Bantry. The group had been prepared for confirmation by the local rector, the Reverend Steve McCann. It was a glorious sunny West Cork day for yesterday’s momentous day in the life of the parish of Ballydehob Union. The parishioners laid on a festive celebration in the nearby Church of Ireland school afterwards. Young people from Ballydehob Union of Parishes on the Mizen Peninsula in West Cork who were confirmed by the Bishop. This entry was posted in Church Services, Confirmation, Diocese, Parish News. Bookmark the permalink.